In September 2018 Djabe introduced its album Flow at a largely successful concert. Praise was given not only to the music but to the extraordinary live surround sounding, also. Flow became popular even abroad and granted Djabe numerous American and European invitations. By popular choice this surround gig once again is on the table, with the whole of Flow. But in 2019 Gulli Briem as a special guest, will be replaced by Ferenc Muck, a former member of Djabe, with whom the album Witchi Tai To will also be played. Originally released in 1998, Witchi Tai To received the annual World Music award of 2000. The album re-released with a surround mix in 2015, becoming the best ever surround Djabe disc. At the Hungarian HiFi Show 2018, the 20-year Anniversary double-vinyl edition of Witchi Tai To was he biggest sensation. Djabe wanted the best possible sounding, and Miles Showell, audo engineer of Abbey Road Studios delivered the half-speed cut from remixed analogue master tapes. The two vinyls spin at 45 RPM, hence the best possible analogue sounding can be experienced. Flow, the first studio album of Djabe renewed in 2016, hit the shelves in May 2018, in CD format. The music was praised by fans and critics alike. The release kept all the characteristics unique to Djabe, but Tamás Barabás and the band once again lept forward. New members not only bring musical finesse but built upon the musical world of Djabe. The rhythm section of Tamás Barabás (bass guitar) and Péter Kaszás (drums) literally re-invented the complete sounding. Peter’s skilled and distinctive vocalization brings freshness to the world of Djabe. János Nagy once again proves that his reputation as one of the best Hungarian keyboardists is not for no reason. Áron Koós-Hutás, an old member returning after many years, became one of the most talented trumpet players of the Hungarian musical scene, and he is only at the beginning of his already ascending career. Most of the pieces were composed by Tamás Barabás, however, 3 of them are a joint effort with band leader Attila Égerházi (guitar). 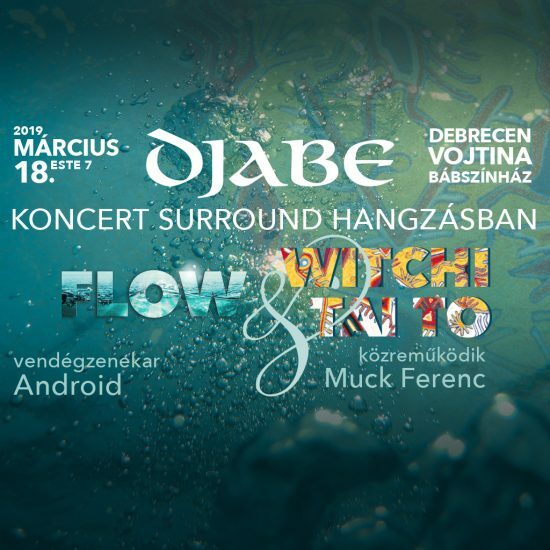 The culmination of Flow is pure Djabe, primarily thanks to musical parts written for specific musicians, by Tamás Barabás. These together provide the Djabe experience fans accustomed to. The second thing is the incorporated history, the ante-Djabe sounding, created by the joint pieces of Tamás and Attila. Tamás Barabás once again excelled in his audio engineering duties: even the CD sounds first-class. But, as we are accustomed to, Djabe never settles for anything less then perfect: the audiophile vinyl version, cut from analogue master tape, hit the stores in September 2018. Standalone in Hungary, the album is available in 2-track master tape. The DVD-Audio release crowns the series, with HD Audio (24bit/96kHz) in both surround and stereo mixes. This surround sounding will be performed on the stage of MOMkult, on 20th March 2019. With speaker systems all around the audience floor, Djabe is to create a gigantic, high-end home theatre where fans can enjoy the full experience of Flow. The 1998 album made with the line-up Ferenc Muck (saxophone), András Sipos (vocal, percussion), Tamás Barabás (bass guitar), Attila Égerházi (guitar). Both the 20-year Anniversary Edition and the surround mix of 2015 (DVD-Audio) will be celebrated at the March concert. Classics like Witchi Tai To, Coffe Break, Visions, Desert and Early Morning Snow will play at the gig. Besides Ferenc Muck, the late András Sipos will also join Djabe on the stage, in the form of audio and recordings. Android is categorized by neoprog and plays progressive rock. In 2009 they released “Édentől Keletre”, an album containing only instrumental pieces. For its 10th anniversary, the band re-arranged and updated the material. This reborn “Édentől Keletre” is soon to be released on CD and vinyl. The concert features this new, updated version.